Spark NLP, developed by John Snow Labs, is recognized for providing state-of-the-art natural language processing in Python, Java & Scala. 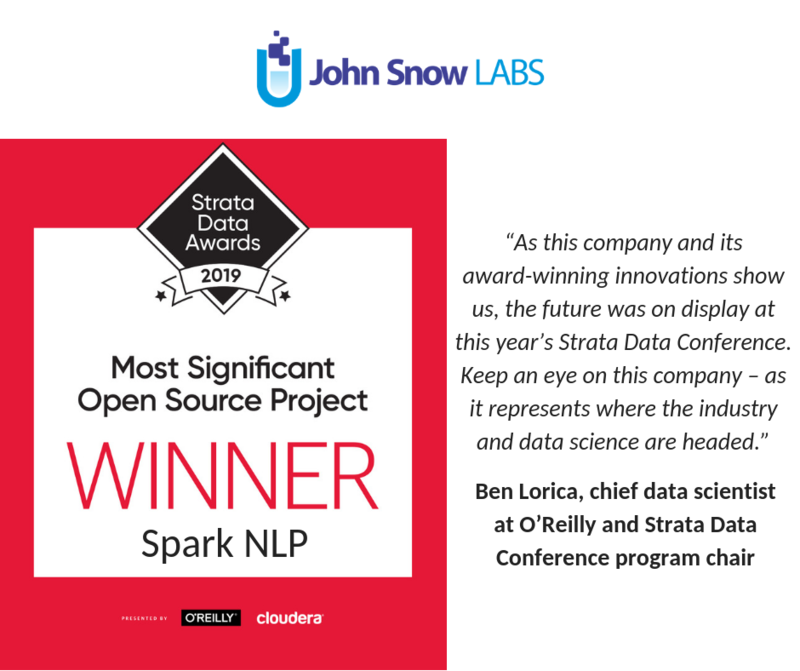 We are incredibly honored and proud to announce that John Snow Labs’ Spark NLP has awarded as the winner of the “Open Source Award” at the Strata Data Awards, which recognizes the most innovative data-driven startups, projects and initiatives from the 2019 Strata Data Conference in San Francisco. The Open Source Award is given to an open source project, tool, or contribution that significantly advances the state of data science. Spark NLP, submitted by John Snow Labs, received the award for providing state-of-the-art natural language processing in Python, Java & Scala. Strata sponsors and exhibitors were invited to submit their project in four award categories and a panel of data science experts selected the finalists. Strata attendees voted this week for the company of their choice in each category. Spark NLP was first released just 18 months ago, but a recent AI Adoption in the Enterprise survey of 1,300 practitioners found that it is already used by 16% of enterprises – showing the industry’s acute need for state-of-the-art, production-grade natural language processing capabilities. “We are honored by this recognition and committed to keep improving Spark NLP as the world’s most accurate, fast, and scalable open source NLP library”, said Saif Addin-Ellafi, lead Spark NLP developer at John Snow Labs. The Spark NLP community enjoyed new releases of the library every two weeks on average since the beginning of 2018. The library’s source code, documentation, and runnable examples workshop are all freely available online.